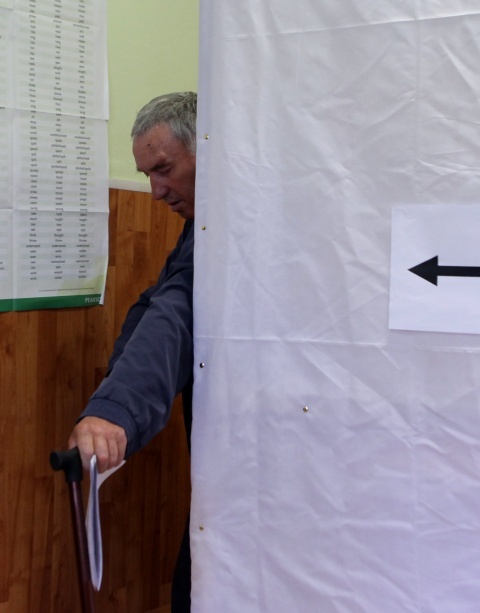 Exit polls in Bulgaria's parliamentary elections suggest the centre-right Gerb party of ex-PM Boiko Borisov has a narrow lead over its socialist rivals. As the polls closed in Sunday's vote, Gerb was projected to win 30-33% while the socialist BSP was on 25-27%. Protests against low living standards and widespread corruption forced the Gerb government to resign in February. The run-up to the election in the EU's poorest country has been marked by voter apathy and claims of fraud. On Saturday prosecutors said they had seized 350,000 illegal ballot papers at a printing house. The election campaign had already been marred by revelations of illegal wiretapping of politicians. President Rosen Plevneliev appealed to Bulgarians on Sunday to cast their votes to ensure a fair result: "Whatever scenarios exist, they don't stand a chance against millions of Bulgarians who can come out to vote." Before the polls closed, Bulgaria's central electoral commission said that turnout was down on the last elections in 2009. At 17:30 local time (14:30 GMT) - two-and-a-half hours before the end of voting - 41.3% of voters had cast their ballots. Opinion polls had indicated that Gerb and the BSP were running neck-and-neck. Gerb has pledged to keep debts under control while the socialists say they will spend more and create jobs. Other parties expected to pass the 4% threshold needed to enter parliament are the Movement for Rights and Freedoms (MRF) - which represents Bulgaria's ethnic Turkish minority - the ultra-nationalist Ataka, and the centrist Bulgaria of the Citizens. If the exit polls are correct, Gerb will fall well short of a majority in the 240-seat parliament. The prospect of an election with no outright winner has raised fears of a hung parliament and further instability. Bulgaria's 6.9 million eligible voters can choose between 36 parties but turnout is predicted to be below 50%. The BBC's Nick Thorpe in Sofia says that despite the large number of parties competing, it is an election that no-one appears to want to win. A caretaker government has led Bulgaria since Mr Borisov's resignation in February. The centre-right leader has said he would be happy to go into opposition and BSP leader Sergei Stanishev has said that if his party wins, he will not be prime minister. Bulgaria faces a major economic and social crisis, our correspondent says, with unemployment officially close to 12% but - unofficially - over 18%. A day before the election, prosecutors revealed they had raided a printing house near the capital Sofia and seized 350,000 ballot papers that were printed over the legally fixed number. Mr Stanishev described the discovery as a "scandal". He said it showed there had been "preparation for total falsification of the elections". The discovery triggered a protest by members of some opposition parties outside parliament on Saturday. The election campaign has also been marred by revelations of illegal wiretapping of political opponents, with prosecutors pointing the finger at former Interior Minister Tsvetan Tsvetanov. More than 250 international observers are monitoring Sunday's election. » Rumen Ovcharov: Clear Statement is Needed on the Benefits of "TurkStream"